Over 200 of the most affordable homes in London are now available to buyers across London and Essex. As part of on-going regeneration in the area, the new homes will now accept applications from anyone who lives or works anywhere in London and Essex. The 221 shared ownership homes at Weavers Quarter in Barking are the first of some 1575 new homes that will be available on the site of the former Gascoigne Estate, which is being transformed into a stunning new development complete with two schools, new high quality public open space and a new community centre. 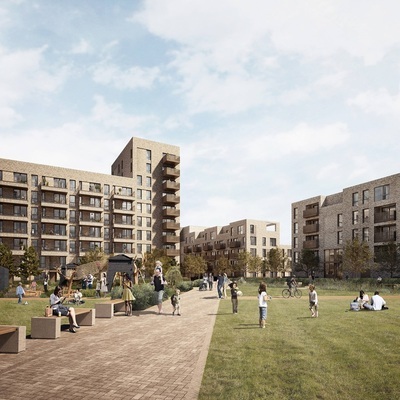 The first phase of Shared Ownership homes comprises 50 one, two and three-bedroom apartments and duplexes, launched recently in the borough of Barking and Dagenham, which was recently listed as one of the most affordable boroughs in London. Tying in with the history of the area, the name Weavers Quarter harks back to the Barking Jute Works; closed in 1891, it was reputed to be the largest factory in the UK. The scheme was designed by Levitt Bernstein Architects; the outer façade of the six new buildings will incorporate hessian weaves into the design. Design features include a Moore fitted kitchen and a range of fully integrated appliances from Electrolux; all bedrooms have Milan Granola wool-mix carpets, and bathrooms have sleek sanitaryware. Each apartment has a private outdoor area and access to communal gardens. Barking station is less than half a mile from Weavers Quarter, connecting to the City in just 15 minutes. The station also connects directly to Westminster on the District Line in less than 40 minutes and to Liverpool Street on the Hammersmith & City Line in only 25 minutes, in addition to Overground services. Prices for a one-bedroom apartment start from £71,250 for a 30% share with a full market value of £237,500. The show apartment will be open Thursday – Saturday 10am – 5pm. Viewings are by appointment only.